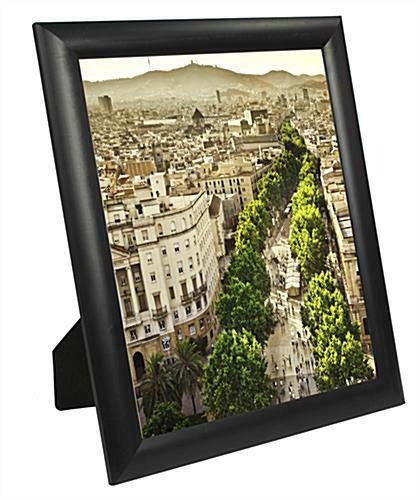 These black photo frames for online photos mounts on a table when using the easel back, or on the wall with enclosed hardware - so whatever surface you need to be free, will be! These accessories are sized for an 8" x 10" display of digital graphics or smaller works of art. 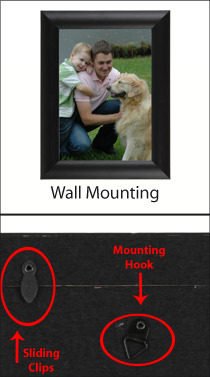 These photo frames, such as picture holder mounts, can be positioned vertically or horizontally. This plastic framing has a smooth, classic profile. These frames, also known as a picture holder system, are perfect for a collection of gallery images in a store, or treasured online photographs at home. The lens is glass to keep images protected. For a simple plastic frame these work well. Deep enough to hold a magazine, which is what I was hoping for. 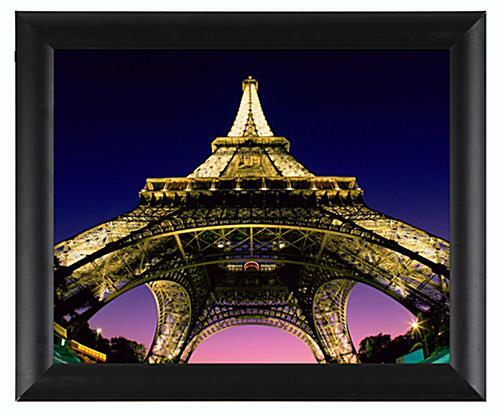 They have a sturdy back held in place with metal hinges and can be used for tabletop or wall hanging. We needed 100 all plastic frames and I was going nuts looking for them. I called this company and got exactly what I needed! Delivery was quick and we were so grateful for the frames! They looked wonderful!